View of the house from Eel Pond. 1887 Victorian. Relax on the porch for sunsets over Eel Pond. Large private backyard for relaxing. 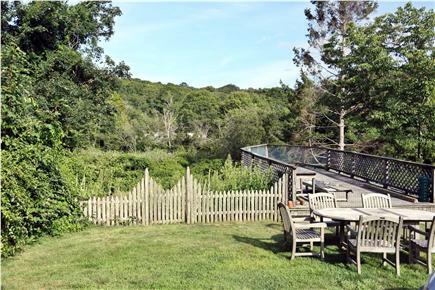 This lovely 1887 Victorian is located in the heart of Woods Hole Village on an elevated lot with magnificent views of Eel Pond. Walk to town for plenty of great dining and great views. 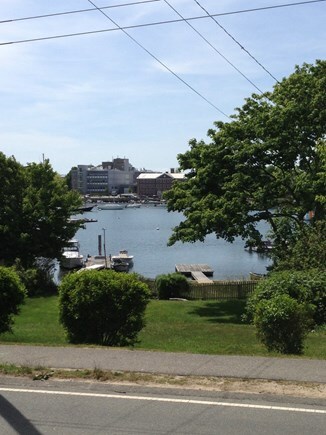 Walk to Stoney Beach for a swim, the Aquarium for seal gazing, or Woods Hole Park for tennis. Bike the Shining Sea Path, or linger on the wraparound front porch taking in breathtaking sunsets over Eel Pond. This house has large windows, lovely sunlit rooms, high ceilings, original charm and fresh paint. The downstairs has an open floor plan with views from every room. The dining room is spacious and seats eight comfortably. It opens onto the kitchen with the washer and dryer tucked in the old pantry. Upstairs has four bedrooms. Three overlook Eel Pond. 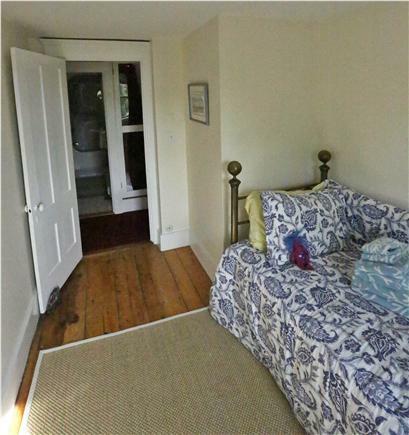 The Master is spacious with a queen bed, six large windows, and tons of closet space. 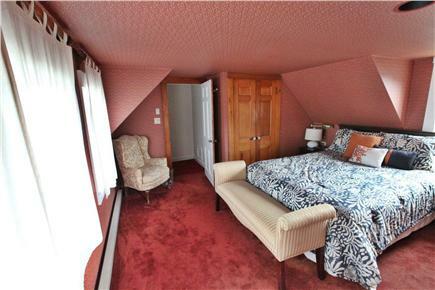 Two of the bedrooms have double beds, and the fourth room has a trundle bed that pops up to make a queen bed. The main floor has a powder room and the second floor has a full bath with a new large marble vanity. We have new stainless steel appliances installed in the kitchen, including a gas stove, microwave, dishwasher and fridge. The kitchen has a Keurig coffee maker, ample pots and pans, plenty of glasses and plates and a lobster pot with all the lobster tools. And a local 24 hour a day contact. Come enjoy and make great memories! Additional pricing info: Multiple month and multiple week discounts also available, State and local taxes of 12.45% will apply. Thank you for the nice review. We are glad you enjoyed the house. The owners continue to make improvements. The front porch has been fully renovated and packed with furniture for relaxing and taking in the view. 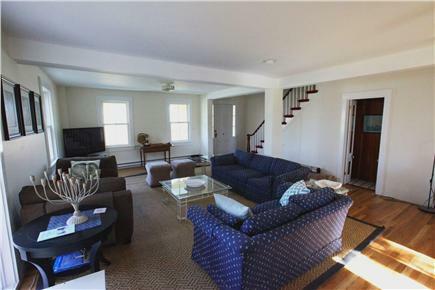 The house is perfectly located, a short walk to town to eat or catch the ferry to Martha's Vineyard, and the beach is a short stroll down the street. You can pull in the driveway and never need your car again during your stay. There is also WiFi, a great wireless Bose speaker, a large TV with premium channels too boot. We look forward to our trip there every year. Thank for the nice review. We are glad you continue to enjoy the house. We swam at two different beaches, played family board games in the living room, ate at the many fine restaurants, walked in the morning for fresh popovers, biked the bike path, took the ferry to Martha's Vineyard, sat on the porch watching the sunset over the harbor, walked the golf course at night to see a meteor shower and had another family over for dinner at the dining room table. This home is the perfect rental for all ages and interests. I highly recommend it. We have owned the house since 2012. It required extensive renovations and we continue to lovingly restore it. We treat all our renters as if they are our personal guests. We want your time in Woods Hole to be as magical as we find it to be. The house is in town close to restaurants, the ferry and the beach. The backyard is very spacious and the wetlands draw birds every morning. The house was built in the 1800’s and has great history and charm. The famous German-born American physiologist and biologist, Jacque Loeb slept here. Woods Hole is a great walking town. Once you arrive, park the car and walk everywhere. There is a great eclectic community of scientists, artists, fisherman, vacationers and more. There are three special events in Woods Hole. The Film Festival, the Falmouth Road Race and the Cape Cod Marathon.